Mother Nature has been on a rampage lately. For those of us not personally affected it may be hard to keep up with all the hurricanes, storm surges, and earthquakes. This year has been unprecedented in terms of natural events that have destroyed our built environment. Perhaps worst of all, we have not been able to generate the political will to attack the root causes of these catastrophes. 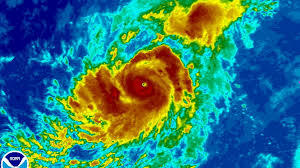 This despite the fact that climate scientists, environmentalists and others have been reporting for decades that one of the effects of climate change is an increase in the number and severity of tropical storms. The latest (as of this writing in late September 2017) is the still-unfolding tragedy that has ravaged the island of Puerto Rico and the US Virgin Islands. As a result of an invasion by a series of monster storms much of the stuff of daily life in these island communities is not now available. Food and water are beyond scarce, some hospitals have become hospices and most of the ways that these American citizens work and live are gone with the wind. Roads, bridges, airports, sea ports and most other infrastructure are destroyed or damaged beyond quick repair. Perhaps most impactful is the almost complete loss of electricity. Puerto Rico's electrical grid is essentially out of business, and will be for some time. This is an especially important loss since virtually everything that must be done to recover from these storms will require adequate amounts of electrical power. Without electricity the heart of the infrastructure on these islands will be on life support. It seems clear that our aging and fossil fuel-based electricity systems are not a good choice for powering our collective future. It's a pretty sure bet that more and bigger storms, tornadoes, wind storms, tsunami, and other atmospheric upsets will continue to increase as time goes by. It is useful to remember that just a few decades ago the kinds of weather calamities we are now experiencing was considered by most to be science fiction. We need to take care to make sure that our collective future includes facing facts and taking action. Right now, according to the website published by the US Energy Administration, renewable energy systems produce just under 15% of our electricity. That figure is rising, according to the Washington Post, at a rate that produced a 300% increase over the past several years. One of the things these figures mean is that we are already underway in developing a technology knows as microgrids. 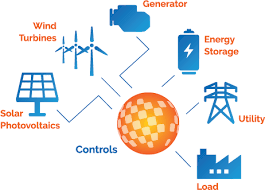 Microgrids are relatively small networks of electricity users with a local source of supply that is usually attached to a centralized national grid. THe most outstanding fact about these facilities is their ability to function independently, particularly in cases where natural disasters have ravaged a country. This fact was supported by reports that existing microgrids and solar photovoltaic systems survived and continued to produce power during our recent hurricanes. 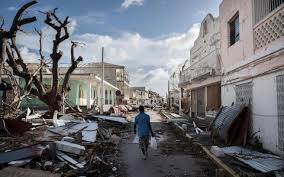 While there are more reports in the making, initial press reports indicate Haiti and Antigua microgrids and solar systems not only survived the storms, they continued to produce electricity as the category 5 storms battered them. Renewable energy sources, led by solar photovoltaic and other solar technologies, offer us opportunities to reduce our reliance on conventional power sources. Unlike fossil fuel technologies solar does not depend on combustible fuels that produce the heat that boils the water that makes the turbines rotate and produce electricity. 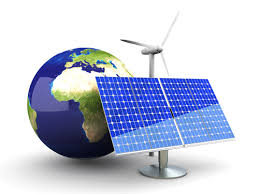 Solar photovoltaic systems have no moving parts to wear out. Typical rooftop installations are engineered to survive 145 mile an hour winds. They are relatively easily installed and energized and can be uninstalled and stored during times of storm or moved to a new location. Several of the locations recently ravaged by hurricanes have reported that their solar "microgrids" not only survived the storm, they were producing electricity as the storm did its work. More and more of the new solar installations throughout the US, and the world, are increasingly not grid-connected to their local utility. This means that particularly hard-hit local systems can continue to produce as the rest of the grid is blown away. Our job is to support the cost effective and environmentally friendly microgrid solution whenever and wherever we can. It is vital that we make our leaders aware of this technology and its growing popularity. We can also act immediately and independently to make renewable enengy microgrids the bedrock upon which our dedication to making all our energy renewable is anchored. We can learn more about our options and opportunities to turn our homes and businesses to storm-proof generators of electricity by checking out a website published by Microgrid Resources Coalition. We can also find out more by choosing to visit websites published by organizations listed on this Google search for Renewable Energy Advocacies choosing from the organizations listed by Google in this search for Microgrid advocacies We have known for a long time that our future will be powered by renewable energy resources. We have also known that it is up to us to lead our leaders in this desired direction. It appears that they need more help now than ever. This current storm season, if nothing else, has taught us that it is time to grow up and get on with it.